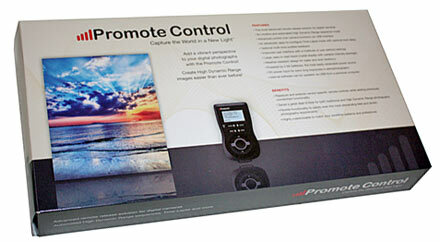 Promote® Control P-CTRL-1 Advanced Remote Control - the ultimate HDR / time lapse controller. Designed for serious amateurs and pros, Promote® Control was an advanced remote control for digital SLR cameras from various manufacturers. Promote® Control P-CTRL-1 Advanced Remote Control. THE PROMOTE CONTROL IS NOW DISCONTINUED - LIMITED ACESSORIES AND PARTS ARE AVAILABLE SEE BELOW. Designed for serious amateurs and pros, Promote® Control is an advanced remote control for digital SLR cameras from various manufacturers. It opens new doors for your creativity with its superior automation and intuitive ease of use. It will have you taking High Dynamic Range (HDR) photographs, time-lapse sequences and much more in a flash. With the Promote Control, you can gain unprecedented, advanced control over your SLR camera in ways that will save you time, especially when taking either traditional or HDR photos. Among a multitude of easy-to-use features, Promote Control offers unique flexibility for exposure bracketing, which is commonly used to create High Dynamic Range images. High Dynamic Range, or HDR imaging quickly gains popularity these days, thanks to stunning detail and tone range rendition. Promote Control propels HDR imaging forward by offering unparalleled flexibility, allowing for bracketing step variability previously not possible with in-camera bracketing modes. Promote Control can also automatically put the camera into Bulb mode as appropriate when performing bracketed exposures longer than 30 seconds, requiring no further user intervention. * The resulting images can be processed in a software application of choice to create a highly realistic image with a wide tonal range. Because it’s highly customizable, the Promote Control can be calibrated to match your personal preferences. Moreover, the Promote Control’s firmware is upgradeable, so the device will stay up-to-date with the latest functionality and enhanced capabilities of future camera models. Click HERE to see compatible shutter cables. The shutter cable is not required for general operation and is optional. Download Promote Control User Manual in PDF format. 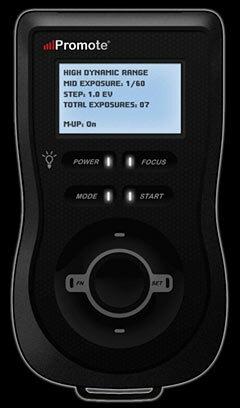 "The Promote Control is an essential tool for better HDR captures. I've only had mine for a week and I can't imagine capturing brackets without it ever again. It allows the most affordable Nikon and Canon DSLRs to outperform the AEB capabilities of even the highest end pro DSLRs. I've tonemapped over 10,000 commerical images derived from HDR files, so you'll have to take my word for it when I say the Promote Control ... is a real game changer." Nikon D5000, D5100 or D800 users require the OTG cable with their purchase. Nikon has an updated USB 3.0 port and is not directly compatible with Promote Control. PROMOTE SYSTEMS - you can CHECK HERE to see the latest compatibility list on the manufacturers website. Looking for other spares or replacement parts for your Promote Control? We keep spares of the original USB connector cable - as supplied with every Promote Control - lost yours - see here. Lost the 'White cable' (Firmware update connector)? - see here. Nikon: D4, D3, D3s, D3X, D2X, D2Xs, D2H, D2Hs, D200, D300, D300s, D700, D800*, D800e*, D40, D40x, D50, D60, D70, D70s, D80, D90, D600, D3100, D3200*, D3300*, D5000*, D5100*, D5200*, D7000, D7100*. Canon Type 2 (CN2 Cable): 100D/SL1, 400D/XTi, 450D/XSi, 500D/T1i, 550D/T2i, 600D/T3i, 650D/T4i, 700D/T5i, 750D/T6i, 760D/T6s, 1000D/XS, 1100D/T3, 60D, 70D. NOTE 1: Canon 300D, 350D, 10D, 20D, 5D Mk I, 1D/1Ds Mk I and 1D/1Ds Mk II cameras are not supported in HDR mode. Only basic operations such as One-Shot, Time-Lapse and Manual Hold are available on these cameras, and would require a CN3 cable to be connected. Other Canon cameras listed above are fully supported, including HDR mode. NOTE 2: On Canon 60D the longest automatic HDR exposure is limited to 30 seconds due to mechanical Bulb mode activation. A future Promote Control firmware update will prompt to activate Bulb mode manually as required. At this time using a higher ISO setting is recommended with Canon 60D if an exposure longer than 30 seconds is required in HDR mode.